How are striae measured in centric diatoms? 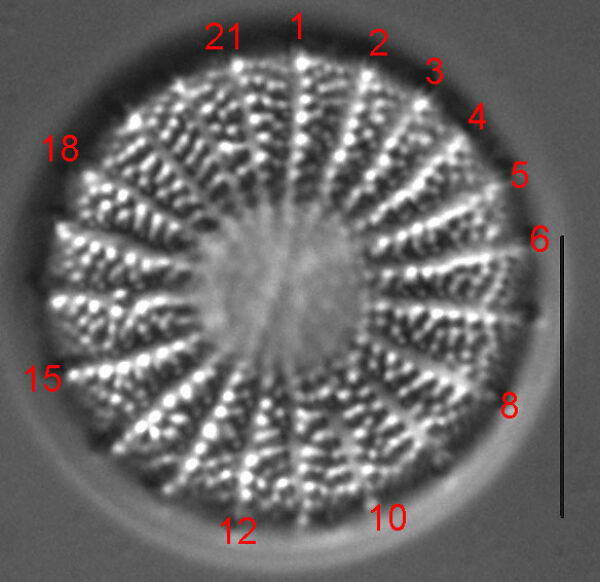 The number of striae, or other rotational elements of centric diatoms, such as fascicles, costae, spines, rimoportulae, fultoportulae and other valve features are often repeated on a diatom valve. This type of symmetry is called rotational symmetry (Theriot 1988). The number and position of a rotational element may be an important morphologic feature. However, these features are reported in different ways by different authors and the measurement approach is typically not included in taxonomic treatments. For example, the number of striae may be expressed as 1) striae density measured along a chord (i.e., typically a 10 µm chord), 2) total number of striae or 3) stria density based on circumference. 1) Stria density, along a chord (Fig. 1). The measurement of the number of striae along a 10 µm chord is recommended in a standard diatom reference (Anonymous 1975). This approach gives variable measures, dependent upon specimen size. Small specimens, in particular, have greater error in stria density using line measures. 2) Number of striae (Fig. 2). A simple count of the total number of striae on the valve. In Fig 2., the circumferential density is equal to 21 * 10 / 54.3 µm, or 3.9 striae in 10 µm. This measure is recommended for use by some authors (Genkal 1977) and on the Diatoms of North merica project. Remember that if you are unsure about the measure that an author used to determine count of striae, or other rotational elements in centric diatoms, use the scale bar on images to measure the values yourself. This approach can be used on everything from line drawings of the 1800s to light micrographs in publications – as long as an accurate scale is included. Figure 1. The red line shows a 10 µm chord. It crosses 5 costae, giving a costa count of 5 in 10 µm. This approach results in large errors for small taxa and is not recommended. Figure 2. This diatom has a total of 21 costae. See text for recommended approach to calculate the number of costa in 10 µm.